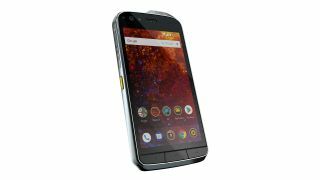 Cat phones has unveiled a new flagship rugged handset which improves upon its predecessor with measures that include an enhanced thermal camera. The Cat S61 (which follows on from the S60) boasts a built-in FLIR thermal imaging camera that has improved software to give it a greater level of image contrast, and an expanded range of temperatures covered up to 400°C. There’s also been an upgrade from VGA resolution (as seen on the S60) to HD when it comes to the detail taken from the rear camera to be overlaid on the thermal image. Cat has further improved the MyFlir app to allow for direct live streaming of the thermal image from your phone. As well as the FLIR camera, the Cat S61 also incorporates an indoor air quality sensor which detects the presence of air pollutants (VOCs or volatile organic compounds), issuing a warning if any dangers are found. Another neat feature is laser-assisted distance measurement which can be used to measure distances of up to 10 meters. In terms of core specs, the S61 has a 5.2-inch screen with a Full HD resolution protected by Gorilla Glass 5. That’s a sizeable step up from its predecessor which had a 4.7-inch display, and addresses one of the major issues we had with the S60. It’s powered by a Qualcomm Snapdragon 630 processor (octa-core, 2.2GHz) backed by 4GB of RAM and 64GB storage. There is a 16-megapixel rear camera, 8-megapixel front-facing camera, and you get a 4,500mAh battery. As for rugged certification, this model adheres to the MIL-STD-810G spec and is IP68 rated, and both dust and waterproof (to a depth of up to 3 meters for one hour in the latter case). The Cat S61 will hit shelves at some point in the second quarter of this year, with a recommended price of £799 or $999.